This paper was written by Michele Zack as part of Altadena Heritage’s Lake Avenue Committee, formed to study aspects of our community’s commercial life. The emphasis is on North Lake for reasons both historical and practical. Other committee members are Thomas Stahl, Mark Goldschmidt, Stephen Rudicel, Eileen Alduenda, and Alan Zorthian, who bring professional backgrounds in architecture, business, urban and landscape design, urban agriculture, and community sustainability to the project. Lake Avenue has been a boundary as well as a major thoroughfare. Its north-south orientation follows a section line created when all California land was first surveyed and grided into square-mile chunks. This occurred after the end of the Mexican-American War when the territory was ceded to the U.S in the Treaty of Guadalupe Hidalgo. California’s unusually fast track to statehood two years later, in 1850, was the direct result of discovery of gold in the north. Lake Avenue (called Prospect in its upper reaches until the mid-1880s) acquired its name at this time because the section line describing it, extended south on the map, ran into an artificial lake built by mission Indians around 1800. A wagon track led north from this lake toward the mountains. Spanish administrators at Mission San Gabriel had used local Indian labor to dam one end of the land depression (now Lacey Park in San Marino) to increase its capacity from a sag pond into a reservoir. Water seepage from the Raymond fault to the north filled “Mission Lake” and soon provided water to irrigate the Rancho El Huerte de Quati. The Spanish Empire in North America ended (1821), California became a state of the new Republic of Mexico, and by the 1840s, this rancho passed to American Benjamin “Don Benito” Wilson who renamed it Lake Vineyard. He extended mission vineyards and orchards as he built an agricultural and real estate empire that by the late 1850s included (in the San Gabriel Valley alone) most of the future Altadena, Pasadena, South Pasadena, San Marino, Alhambra, as well as parts of other communities. The lake at the bottom of Lake Avenue drifted out of public consciousness in the excitement of Southern California’s real estate development. After 1869, the Transcontinental Railroad made it easy to get to here. Pasadena, established in late 1873 as a land and water company, was the center of a land boom that was racing out of control by the mid-1880s; the bubble burst in late 1887. The wagon trail from Lake Vineyard up to the mountains was more than a mile east of the first settlement; Pasadena, however, quickly expanded east to include its southern portion. Cardinal directions and addresses were assigned to properties after Pasadena incorporated in 1886, when the town center was still “The Corners” at the intersection of Colorado and Fair Oaks. Sections of streets above Colorado had “north” affixed to their addresses, those east of Fair Oaks “east,” and so on. Lake Avenue (or Prospect) extended up the hill to agricultural land known simply as “The Highlands.” The new subdivision, Altadena, was launched in 1887, at almost the same moment boom was turning to bust. The timing of Altadena’s developers, led by John Woodbury, was off. After buying 917 acres for $5 an acre in 1882, they didn’t begin investing significant capital until 1885 to connect to Pasadena’s rail systems, to develop water sources, and to create dramatic marketing materials. A few mansions had been built or were then under construction along Mariposa Street; these, when added to a few rusticated existing ranches and vineyards, comprised John Woodbury’s hopeful vision of an upscale community that would attract Midwestern wealth. Engraved images of actual homes, gushing water sources, and an imagined grand hotel and a rail service yard on the Arroyo appeared on the new subdivision’s map. “The business center will be started on the west side, near the Arroyo,” a newspaper article quoted Woodbury, “because the land is comparatively flat there.” His plan made sense; besides being flat, it was a beeline from Pasadena’s actual commercial center at Fair Oaks and Colorado to Altadena’s imagined one, and the shortest distance to build a rail line. Woodbury planned for the community of gracious homes and bucolic small farms to spread from west to east toward Lake Avenue, following Pasadena’s development pattern. 1) Even catastrophic downturn could not stop growing hordes of those who still had money from visiting California (aka the “Garden of the West”) for health and recreation; with its grand hotels, excellent winter climate, capital and cultural resources, Pasadena was a magnetic force within a nascent tourism industry. Many who came added the San Gabriel range’s camps and hotels to their itineraries as Americans developed a recreation culture and fascination for mountains. 2) No less than three lines connected busy Pasadena to sleepy Altadena in the late 1880s; by 1890 these had been consolidated into Henry Cross’s Terminal Railway, providing transportation to take advantage of new tourism and future real estate up cycles. The first (Woodberry’s Altadena/Pasadena Railway, 1887) and second (Painter’s City Railway, 1888) were chiefly west side operations. They connected to the Painter/Pintoresca Hotel at Fair Oaks and Washington Boulevards, and along the Arroyo Seco (to pack train depots heading to Switzer Canyon Camp, and to the site of expected commercial development). Connections to Mountain View Cemetery (established 1882) as well as to popular trailheads (the Giddings and Owen Brown trails) in Millard Canyon also became accessible. The third, soon-consolidated line was George Swartout’s Highland Railroad, which began service further to the east. There wasn’t enough traffic and when it failed it had reached only as far as New York Drive. But Swartout’s franchise included rights to build all the way up Lake Avenue, and over to Las Flores Canyon in anticipation of a line up to Mount Wilson. 3) The most advanced engineering project in the world, The Mount Lowe Railway (originally planned as The Mount Wilson Railway), was shovel-ready in 1891. It began at the corner of Calaveras and North Lake Avenue, at “Altadena Junction.” The first segment opened in 1893; this was a regular electric trolley line that entered Rubio Canyon and traversed along its west wall about a half mile. Rubio was a narrow, steep, and utterly wild canyon whose entrance was about 10 minutes from Altadena Junction. The lovely and rustic Rubio Pavilion dramatically spanned the canyon floor and was an instant success. Visitors enjoyed a dance hall, restaurant, hotel, wooden walkways and stairways hung with Japanese lanterns that threaded through fern grottos and passed by lovely waterfalls. The Pavilion made nature, enhanced with exciting commercial possibilities, accessible to the masses via a cheap trolley ride — but this spot was more important for another reason. Thaddeus Lowe and his engineer determined that Rubio would be the jumping off point for the railway’s innovative “Incline” section. This was a precipitous electric hybrid-powered project that improved upon technology adapted for San Francisco’s already-famous cable cars. It offered an easier, modern, and more expensive alternative to the popular new Mount Wilson Toll Road, built at Altadena’s eastern edge on Eaton Canyon. The Great Era of Hiking was on, and the Toll Road was drawing thousands in foot and hoof traffic on weekends by 1891 to access mountain camps, cabins, and rustic hotels. The Mount Lowe Railway was different, high-class, new: perhaps the first vertically integrated tourist destination in the world, it included through rail transport from Los Angeles, elegant hotels (including Echo Mountain House and the Craftsman-style Alpine Tavern), restaurants, shops, a post office, zoo, fox farm, cabins, and miles of hiking trails. Not only was Pasadena’s alcohol prohibition not enforced in the mountains, its wine lists vied with ones at best hotels in the country. Although most locals never rode the Mount Lowe Railway, 60,000 visitors took the thrilling Incline Rail to Echo Mountain the year it opened, 1895, on Fourth of July. All poured through the sleepy outpost of Altadena. Pasadena’s grand hotels and numerous shops benefited greatly, but little infrastructure existed in the highlands to attract tourist dollars. Through trains from Los Angeles to the Mount Lowe railway were soon heaving up Lake and Fair Oaks Avenues from Pasadena on lines and rights of way purchased from failed predecessors. All converged at Calaveras and Lake Avenue, and Altadena became a major hub for mountain tourism. Rail tourists journeying to Rubio Pavilion, Echo Mountain, and Crystal Springs, as well as equestrian patrons of the Tally Ho stable, who rented horses and carriages to access Mount Wilson camps via the Toll Road, all stopped at Altadena Junction. The Junction’s large stables and beautiful brick power house at Calaveras on North Lake Avenue (intermittently empty/underused now for years because no new business can meet parking requirements,) remind us of a time when entrepreneurial spirit was not yet ruled by the automobile. A second Altadena transportation hub developed a few blocks to the north at the corner of Lake and Mariposa when an east-west rail “Dinkie” (smaller gauge) line traversed there from Fair Oaks in 1903. This also connected to the Mount Lowe Railway, bought by Henry Huntington’s Pacific Electric, established the same year. By 1912, PE had gobbled up all smaller, less profitable lines to become the world’s largest inter-urban rail system, connecting 50 communities in four counties over 1,164 miles of track. Unlike the more rusticated “country corners” at Calaveras and Lake, small businesses began to sprout at this flatter intersection. La Mariposa Hotel opened in 1907 as Altadena’s first commercial building of note. In the Progressive Era preceding the boom of the 1920s, Altadenans also first began debating (and rejecting) the idea of incorporate as a city. Many surrounding communities had taken this step, or decided to do so in this period, to take control of development and gain the power of the local ordinance. City or not, the area around Lake and Mariposa began to be referred as “the heart of Altadena’s business district” as the unincorporated town’s population grew faster than anyplace else in L.A. County in the 1920s — from 3,000 to nearly 20,000 people in less than a decade. So many newcomers without established shopping habits in Pasadena ushered in Altadena’s first golden age of commercial development along Lake Avenue, and also to the west along Fair Oaks and Lincoln Avenues. New businesses proliferated as more housing — affordable, median, and luxurious — was built. Extensions of Altadena Drive and New York Drive east of Lake, as well as a Dinkie line along Mendocino to the Country Club, (established in 1911), opened new access to East Altadena for home building. With more residents, East Washington Boulevard between Hill and Altadena Drive, and a node at Allen and New York, also began to develop commercially. Country Club Park, a subdivision of one acre-plus lots on 500 acres of the old Allen Ranch, began the infill of the last huge open land in Altadena and shifted exclusive housing to the east. Since the mid-1880s, the finest homes were concentrated along Mariposa Street between Fair Oaks and Lake. While many of Altadena’s farmers, dairies, and commercial nurseries continued to favor far-west Altadena because of superior water resources and soil, the cost of water was not an issue for middle and higher income residential users. Land prices on the west side were cheaper, and attracted a mix of modest, middle income, and agriculturally-inclined buyers. Elisha P. Janes built close to 200 small charming Tudor-style cottages in the central-west area between Marengo and Lincoln, for which he acted as builder, landscaper, sales agent, and financier. He’d boasted he would build 500 “homes of distinction,” before bankruptcy forced him out in the construction panic of 1927. Janes Cottages sold for $500 down and about $100 a month mortgage payments. The division of large parcels into1/4 and 1/5-acre lots created new middleclass neighborhoods and encouraged businesses along Fair Oaks and Lincoln. Altadena’s many advantages explain its phenomenal growth in the 1920s. Beyond natural beauty and mountain views, the community enjoyed an extraordinary range of attractive real estate options — and terrific transportation links to Pasadena and Los Angeles for jobs, shopping, culture, and entertainment. That it remained unincorporated meant enforcement of Prohibition was not as strict as in Pasadena, founded as a Temperance Town. Webster’s Pharmacy on North Lake was the only place in the San Gabriel Valley where one could fill a prescription for alcohol, and liquor was available at two popular dining destinations, the Marcell Inn in at the top of Lincoln, and the private Altadena Country Club east of Lake Avenue, as well as a number of smaller establishments along Lincoln and in nearby mountains. 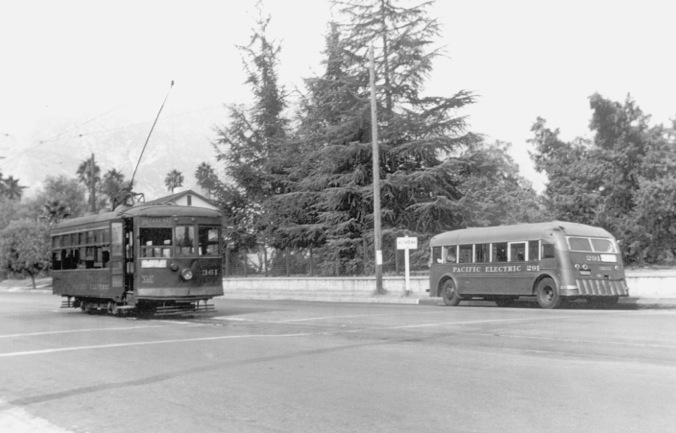 Automobile ownership skyrocketed and commercials areas developed in the 1920s, but Altadena remained a streetcar suburb. All of its shopping areas were built as, and have remained, long, skinny affairs — mostly along steep north-south grades. Residential builders immediately cozied up directly behind, adding conveniently located, modest housing. No business blocks or a town center were developed, with the possible exception of Mariposa and Lake. This seems to have occurred via a combination of three factors: Altadena’s abundance of good public transportation (so many ways to get out of town to Pasadena’s delights lessened the need for a center); much still open land; and, third, a total lack of planning. Once the pattern of housing being built directly behind shopping areas was established, with little-to-no provision for commercial expansion or parking, it continued. No local agency was focusing on the future and people liked to live near shops. At least once a decade from the turn of the century through the 1960s well-funded, thoughtful campaigns failed to convince a majority of Altadenans that the benefits of cityhood — with its planners and budgets, politicians and bureaucrats — outweighed costs. The Great Depression was a time when Altadena residents pulled together and newcomers kept arriving. Social institutions such as clubs and PTAs proliferated, and — aided by county, state, and federal agencies and money — infrastructure improved and increased. Altadena’s landmarks were almost all built on or within a block of Lake Avenue: Farnsworth Park, the William Davies Recreation Building, the new Sheriff’s station, The First Federal Savings and Loan Association of Altadena, Altadena Library, Eliot Junior High School, and a new Altadena Elementary School. Including schools in other parts of town, a total of six were built or significantly expanded within 10 years. Lake Avenue remained residential south of New York and north of Altadena Drives. A major loss during this era, closure of the Mount Lowe Railroad in 1936, and an addition, opening of the Los Angeles Crest Highway a to mile the west, hinted at changes to come in the American lifestyle. However, it is not hard to imagine people thinking: with so much civic and commercial development going on, who needs another layer of government telling us what to do and taxing us? Yet another cityhood initiative failed, as Pasadena continued to nibble away at the shrinking Altadena’s edges in 37 separate “bites” as that incorporated city sought to increase its own tax base. Altadena’s second and final commercial and residential boom occurred post World War II. Demand for housing had grown through almost 20 years of depression and war; after it, new federal insurance of home loans dramatically expanded credit to those who had never before had access to it. This, combined with millions of new GI Bill beneficiaries, drove the largest expansion of homeownership in US history. Altadena, still with no planning agency closer than Los Angeles County to monitor building practices, was an attractive site for builders. From 1946 through the 1950s and into the 1960s, almost every spare scrap of land, most on the west side, but also on the east in Presidents Street developments, filled with the new “ranch” houses accommodating families making the baby boom generation. The Westside’s last agricultural land (mostly dairies) was subdivided, along with many large old estates such as those built by the Zane Grey, Green, and Scripps families. Absent planning or much oversight of the construction frenzy by Los Angeles County, the quality of building, subdivisions, and public infrastructure often fell short. However, Altadena grew to its largest population, over 46,000 people. The modern community emerged, by all accounts a fairly congenial mix of working, middle, and upper class citizens — overwhelmingly white — with great schools and cozy neighborhoods. PTAs and garden clubs flourished, and rolls at men’s service clubs grew. New residents pushed the local economy to its highest point. Lake Ave hummed: restaurants, dry cleaners, drug stores, medical offices, groceries, contractors, newspapers, hardware, garden, and construction supply stores sprang up. Established businesses such as Altadena Plumbing expanded with a new fleet of six panel trucks. The two oldest businesses (other than Mountain View Cemetery and the Country Club), Altadena Hardware and Websters, at the Lake and Mariposa hub, also grew. Frank Webster bought adjacent buildings (including the old La Mariposa Hotel) allowing for a larger pharmacy and liquor store, and the soda fountain became a restaurant with counter service before he died in 1950. Steady growth, sometimes described as dull, marked the 1950s and early 60s. But upheavals from the mid-1960s through the 70s hit Altadena hard. Local causes included battles over desegregation of Pasadena Unified School District, of which it is a part; redevelopment in Pasadena that displaced a disproportionate number of black people; and the construction of two freeways, the 134 and the 210, which took out whole neighborhoods. Close to half of all Altadenans left, and were replaced by people of color settling mainly on the west side. “Red-lining” was used by real estate agents to discourage Caucasians from purchasing properties west of Lake Avenue, which became a new racial boundary. The most obvious commercial casualties of all the disruption were businesses along the Lincoln and Fair Oaks corridors, which became blighted. Two supermarkets left, other businesses failed or struggled, and new ones did not fill their places. By the mid-1970s Altadena suffered major losses in overall property value. While most obvious the further west of Lake Avenue one traveled, even homes in still upscale neighborhoods in the east, and mansions and upper middle class housing in the central historic zone, were bought as bargains. Lake Avenue remained the community’s last viable commercial area. Another major problem is the high number of absentee landlords holding commercial real estate who prefer to leave it vacant and/or blighted and underused for tax or other reasons not always discernable. When this goes on for years, such as it has at the northeast corner of Lake and Calaveras, the county has not been able to do anything about it. Eminent Domain — (seen by many as the nuclear option) — has never been invoked. Because Altadena is not an incorporated community and unlikely to become one, citizens lack the power to do anything to correct the above-mentioned impediments without help from L.A. County. Altadena Heritage, the Chamber of Commerce, any number of other civic organizations and citizens are hoping that the visioning process under way preceding the update of our Community Standards District will empower the community with tools necessary to stimulate economic recovery. Bringing shops and services back to the community, places where people could spend money, would help Altadena create a more sustainable future. Seventy-one percent of the current population of 43,000 lives in owner-occupied homes and average household incomes are above $70,000 in Altadena. Such numbers compare favorably to Pasadena’s, and are not all that different from nearby Sierra Madre’s, where a population of 10,000 supports a lively downtown of shops, restaurants, and service businesses. Altadena could certainly enjoy a renaissance of economic vitality, if citizens and institutions work together with LA County Planners in revising the CSD in such a way as to encourage, instead of deter, entrepreneurial activity. Methods and tools proven successful in other communities do not have to be invented — they exist and it is time to begin using them in Altadena.